I had a fabulous childhood. I remember running around the neighborhood with my best friends, playing with Barbies with my sisters, setting up lemonade stands on the corner. Actually, I recall only tolerating the lemonade stands because Elizabeth loved selling lemonade. Or was it the thrill of making money? Either way, those lemonade stands are a happy childhood memory that make me smile when I think about them…even though I still cringe when my own kids ask if they can set up lemonade stands of their own. I remember running for student government in 6th grade, and moving to a new town at the beginning of 7th grade…but having to commute 45+ minutes to school until we completed the move. I have fond memories of running around with my cousins on holidays, and anxious memories of getting locked in the bathroom at my Grandma and Grandpa’s house. But like I said at the beginning, they all add up to a fabulous childhood. To join the fun tweet using the hashtag #YesMemory and follow @YesVideo on Twitter. The best way to follow the party conversation is to use the TweetChat room assigned to #YesMemory. 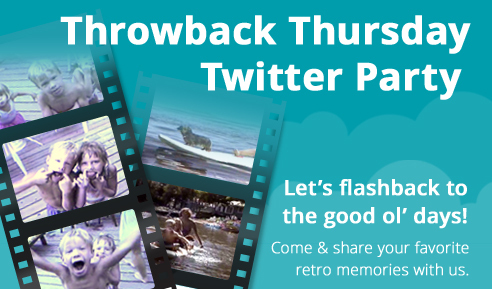 During the Twitter Party we will discuss our favorite childhood memories, how to preserve those old family home movies and share our vintage Throwback Thursday photos. Not only are we an awesome group to spend an hour with…but we’ll be handing out some equally awesome prizes. *Prizes will be given away randomly during the Twitter Party to people tweeting with the hashtag. Must be in attendance at the Twitter Party using hashtag #YesMemory to be eligible to win prizes. Be sure to RSVP before the party. Hope to see you there!